Well what a week, we're really starting to see the fruits of our labors. Tons of people are listening! The biggest thing of note from this week was from yesterday at our zone conference. Wow it was incredible! Oh and the mission doctor was there and he did surgery right there in the church on my foot (Ingrown toenail not fun). He talked about repentance and if we're truly penitent, we won't have to talk about abiding by the rules of the mission, we'll just do them automatically. Which is kind of funny because I've been reading "to draw nearer to God" by President Henry B. Eyring right before lights out time and the part of the book that impacted me the most was on the same topic. There was a man that had committed serious sin and although the bishop (President Eyring) had forgiven him on behalf of the church a while ago, he wanted to know if the Lord had truly forgiven him. Later acting on advice from then Elder Kimball, he asked of the young man if he was attending priesthood meeting and otherwise participating and those types of questions. He was doing that and so that showed that he was doing everything possible and for that, the Lord will forgive them that "are stripped of their pride." I've been trying to look for these areas, where I can do more, do better, to serve the Lord. Thanks all of you for your love and support especially Sister Jones and Barb for the letters, I just got them today thanks! 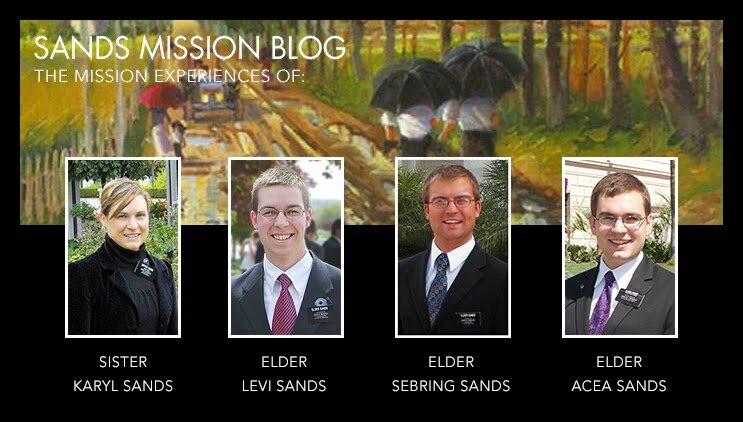 NOTE: ELDER SANDS P-DAY HAS BEEN CHANGED FROM MONDAYS TO WEDNESDAYS, SO LETTERS WILL NOW SHOW UP ON THE BLOG IN THE LATER PART OF THE WEEK. Wow what a week! Sorry I don’t have a lot of time but let me share a funny story that usually happens in the MTC. One of the things that is kind of like a right of passage is to have a dream in castellano or Spanish. Well I don’t really have a lot of dreams anyway but apparently I talk in my sleep (it runs in the family, ask my parents about Sebring and the Ten Commandments). So I believe it was the day before yesterday, I talk in Spanish when I sleep! Yeah I guess I just skipped the whole dream in Spanish part and I just talk 24/7 in Spanish! Jajaja. Well the work is just that, tons of work. We’re moving mountains out here! I can testify to the quote that I believe it was Ezra Taft Benson that said "the secret to missionary work, is work!" I can tell you that when I’m working really hard when I get to the apartment and just collapse on my bed after planning and such those days are the best! When we’re truly giving everything to the Lord, that’s when we’re going to be the happiest! Thank you for everything and I’ll try to send some pictures the next week of me cooking or something! Well my parents asked if I'm feeling like a real missionary again, well I've gotten use to not doing very much and yeah, it's coming back to me. This week is when we really pick it all up. I'm starting to know the area and we found a lot of new people to teach this last week. I'm really disorganized right now! I basically arrived and we went out to work so I still haven't unpacked! Everything is crazy, but a good crazy! It is amazing to really be tired when I arrive at the apartment every night. It's something that I haven't really felt in a long time! So I'm really excited this week as we have a lot of new ideas for the area that will get the area moving again in missionary work. It's really been dragging for a long time. The members still don't really trust us too much so for my testimony-introduction in sacrament meeting; I kind of dropped the cane on them all about their responsibility to do missionary work, to talk about the gospel with their friends and such. It's also really great to have a companion that really wants to be really obedient! When we're obedient you can feel the difference; the spirit is so much stronger. Well time to work like they say here in Argentina ¡Trabajarámos a ful! Thanks for all of your support and love! Well it's transfer time! It is always really exciting and this transfer was really weird! I'm not in Bolivar anymore which was really kind of sad. All of the members were really sad to see me go. I actually got a little bit emotional. Not quite to tears, but I'm really going to miss them! Two girls that I had the opportunity to teach and baptize were really sad to see me go too. They wouldn't even let go of my hand for like an hour! It was a little bit awkward but it was really nice to know that I'm really going to be missed. It's an amazing thing this mission. It's one of those things that you just can't quite put completely into words, but it's a roller coaster! You come in completely blind (and really in Bolivar because we arrived together) and you get to know the people the streets the places and then bam one call and you're ripped away from all of that. As I always say "Así es la vida." As for me I got transferred to the place that I believe a lot of you thought I was at. I'm now in Olavarría. It was a really short transfer. It's like getting transferred from the Beacon Hill Ward to the Lincoln Heights Ward. I'm even in the same district and my District leader is now my companion. So that's what happened. The area is really slow right now because unfortunately some missionaries before were doing some stuff that made the members lose all confidence in the missionaries. So now we have to gain back that confidence. Elder Lopez (my new companion) and Elder Taliercio (the missionary that was with him in this area the last two transfers) have gained back a little bit of that trust but there's a lot of work to be done! I'm really excited for this transfer because Elder Lopez is really obedient and that is exactly what I want! He is from Mexico City so I hope I won't pick up his accent too much. I've got a very defined argie accent for a Yankee (that's what they call Americans here). So we'll see if I start developing the Mexican accent. I hope not but I'm really looking forward to working like crazy this transfer!